Businessman's Map Of South Africa = 1 : 1 000 000 and 2.59m wide x 1.50m high. This new edition Businessman's Wall Map of South Africa includes the latest name changes within South Africa. The map content depicts the 9 provinces in different colours for easy reference. major cities, colour coded countries with country borders. The map is fully indexed with new and old names listed. 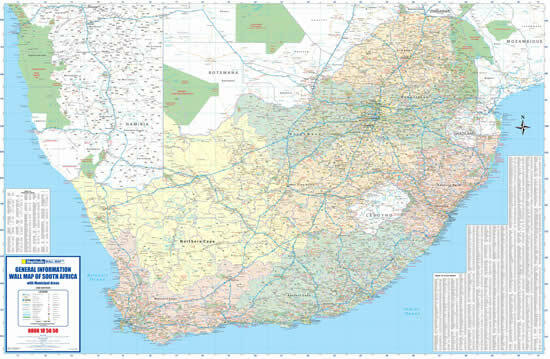 General Information Map Of South Africa = 1 : 1 500 000 and 1.56m wide x 1.01m high. This map indicates the nine provinces of South Africa in different colours and shows their municipal districts. Mineral Map Of South Africa = 1 : 1 500 000 and 1.56m wide x 1.02m high. shows Alluvial and Kimberlite diamond mines. South Africa Provincial = 1 : 2 000 000 and 1.02m wide x 0.89m high. places of interest, national parks and reserves. South Africa Physical = 1 : 1 750 000 and 1.1m wide x 0.90m high. South Africa Political= 1 : 1 750 000 and 1.1m wide x 0.90m high. Municipal Map Of South Africa Wall Map. Sample of Businessman's Map Of South Africa Detail / Enlarged.